Bobrick Stainless Steel Touch Free Paper Towel Roll Dispenser – BOB 2860 Surface mounted paper towel dispenser is ideal for high traffic restrooms in offices, hospitals, hotels, convention centers, etc. Features a touch free mechanism that keeps hands clean and unit sanitary. Dispenses a 12″ length of nonperforated paper towels. 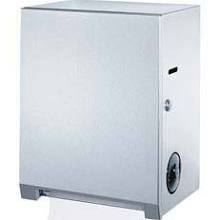 Dispenser features a keyed, tumbler lock that keeps dispenser closed and prevents theft of towel roll. Can hold a paper towel roll up to 8 ” in diameter and 8″ wide. Dispenser has cabinet slot indicating refill time.